And you have to learn to take the crunchy with the smooth, I suppose." --Billy Bragg, "Walk Away Renee"
The Smooth: I think I finally got the living room in our apartment the way I want it. Or close enough. If asked, I will vehemently defend the fact that I believe in ghosts. Part of me thinks this has less to do with a unwavering faith in the supernatural and more to do with the fact that if a ghost somehow, I don't know, hears me saying I don't believe in him, he might show up at my bedside at 3am, chains clanking, all OH REALLY? Thank you. No really, thank you. In fact, come here, you big hunk of love, and let me give you a hug. Now that you've hit the home run that broke Hank Aaron's record---and you did it in San Francisco, god bless you, sir!---I can finally have my boyfriend back. When we first moved to Charleston, which was at the very beginning of 2003, we moved into the ground floor of a large grey house downtown, a house with a wrought-iron gate that made up for the fact that the kitchen was essentially just a countertop and an oven in the living room, and that the only electrical sockets in the whole apartment were, bizarrely, halfway up the wall. If, for some reason, you find yourself up and awake at 7:50am tomorrow---and, really, I don't think there's any excuse for that on a Saturday, except maybe if you have a small child, in which case you'll probably have been up for, like, four hours already, OR MAYBE SINCE IT WAS BORN---you should turn on the CBS Early Show to watch my televisual debut. 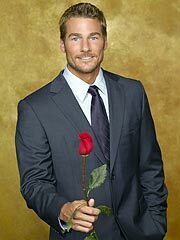 Well, here he is, ladies and gentlemen, Brad Womack: the fine young stallion ABC has chosen for the newest season of The Bachelor, and a guy whom my friend Alison described as looking like "that Sigma Chi who'd slip a roofie in your drink when you weren't looking." I mean, is she right or is she right? Wow, that's crazy, I had no idea you all had such strong opinions about Secret Bachelor Tuesday! Thank you for all your comments and votes. I really like the idea of a modified SBT---a Secret Bachelor Tuesday Lite, if you will, just one calorie!---so a millions thanks for that idea. And I certainly know who to go to the next time I need to make a decision. Do you think you'd all be this good with shoes? "But Those Are The Times When I Just Forget"
I collect travel quotes like other people collect stamps. Wait, no-one collects stamps anymore, do they? Well, alright then, I collect travel quotes like other people collect baseball cards. Or coins. Or---seriously, what do people collect these days? Positive eBay feedback? Witty text messages? Unemployment? I've figured out how to get things done around here: you just invite people over. Seriously, the only reason we got our act together and drove to IKEA and picked a coffee table a few months ago was because I spontaneously decided to host a dinner party, and Sean, sweetheart though he is, couldn't abide the thought of people sitting around on our new sofa with magazines piled up around their knees on the floor. Actually, I lie, Sean could totally abide the thought of that. Hey, remember when I was having my earlobe sewn shut and the plastic surgeon said "God, I'm so out of it"? And then I was having a cavity filled and the dentist was talking about how he'd got someone "all messed up" the night before? Well, apparently those guys went to medical school with the guy who was taking my blood this morning, and they all took the same elective called Things You Just Really, Seriously, Honestly Just Shouldn't Say To A Patient While They're In Your Care. Whoa, Internet, stop what you're doing! We have an emergency. Specifically, we have a hair emergency. And you know that's the most serious kind. Here are a few things that will always happen: you will always wake up on the morning of your hair appointment and be having a good hair day for a change. You will always think "crap, do I really want to do this?" You will always arrive early to the salon and flip through some of those hair magazines and change your mind a hundred times.